Of course we all know that a boneless, skinless chicken breasts are an excellent source of low-fat, healthy protein, but the thought of eating one is about as enticing as doing your taxes. It’s very tricky to cook them all the way through without completely drying them out and unless you’re dipping it in some kind of butter-bacon-cheese sauce (don’t get any ideas Appleby’s!) you’re going to feel like you are performing culinary penitence (and maybe you are. No judgments). The genius of this recipe is that the breasts are so thin that they cook very quickly and so hold on to a lot of their juices, and the sauces (at least the one I made) are incredibly flavorful and robust. Have you ever sliced a chicken breast in half horizontally? If not, don’t be intimidated. Wait: be a little intimidated. But do this: use a sharp knife, go slowly, and don’t worry if they’re not even (mine are, every time, but you do you). Most recipes will tell you to freeze the breast for a few minutes to make it easier so try that if you’re really nervous. After you’ve done this you’re in the home stretch. You will then pound them into 1/4″ thickness (I put mine in a ziploc bag to keep surfaces clean and prevent raw chicken collateral damage). Then the sauce. The recipe calls for 1/4 cup hazelnuts, toasted and skinned. Good luck. I toasted mine and then attempted to get the skins off and after a frustrating 3 hours (aka 5 minutes) I realized I wasn’t going to live forever and I ditched them for slivered almonds. The nuts get toasted again in a skillet with bread cubes and olive oil with some garlic thrown in at the end. All of this goes into the food processor to chop a bit before adding roasted red peppers from a jar (an ingredient you should have in your cupboard all the time), sherry vinegar, a little more olive oil, smoked paprika (<3), honey, cayenne and salt. Process to a chunky consistency. As I mentioned, the breasts get a very quick saute and please don’t freak out at this point and over-cook them. Remember: they are 1/4″ thick; the odds of them being even a tiny bit raw in the middle are very, very low. 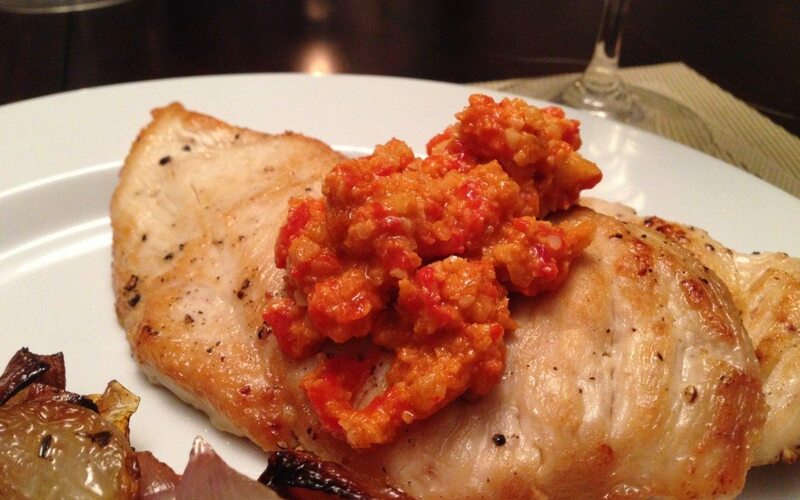 If you’re familiar with Romesco sauce this one will seem familiar. I love it so much I want to spoon it on everything. And you could; eggs, fish, turkey burgers, sandwiches. 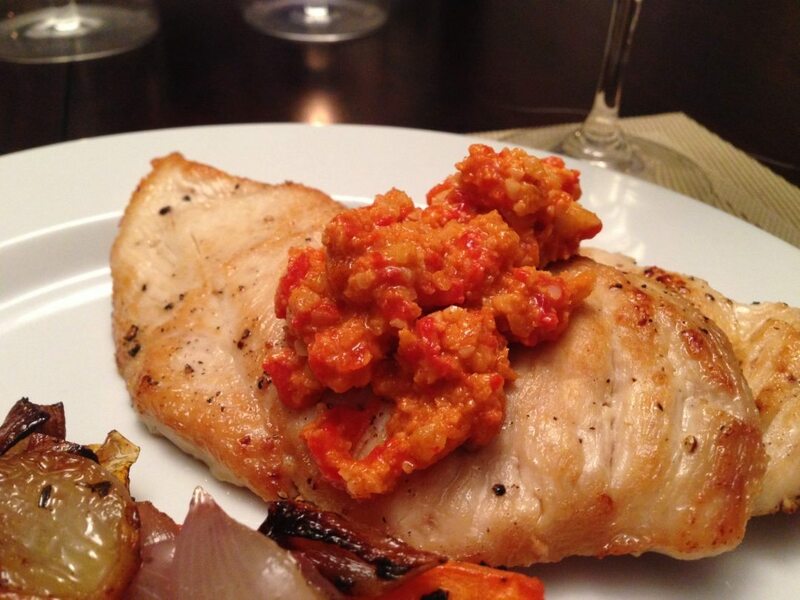 The nuts, the red peppers, the sherry, the smoked paprika — it all comes together to make a vibrant and interesting combination of flavors. Heat bread, nuts, and 1 tablespoon oil in 12-inch skillet over medium heat; cook, stirring constantly, until bread and hazelnuts are lightly toasted, 2 1/2 to 3 minutes. Add garlic and cook, stirring constantly, until fragrant, about 30 seconds. Pat cutlets dry with paper towels; sprinkle each side of each cutlet with 1/8 teaspoon salt and season with pepper. Heat 2 teaspoons oil in 12" skillet over medium-high heat until smoking. Place 4 cutlets in the skillet (I was only able to fit three at a time) and cook without moving them until browned, about 2 minutes. Flip cutlets and continue to cook until second sides are opaque, about 30 seconds. Transfer to platter and tent loosely with aluminum foil. Repeat with remaining 4 cutlets and remaining 2 teaspoons of oil. Serve immediately. You are correct Carla. I have corrected it and added 1 teaspoon of honey. Thank you!! !